Polkadots on Parade: Plum District: Extreme Game Truck! I'm so excited about this deal from Plum District!! I'm getting it for my son's birthday party, and he is going to flip! Kids love games and kids love parties! and have the Extreme Game Truck come to you! 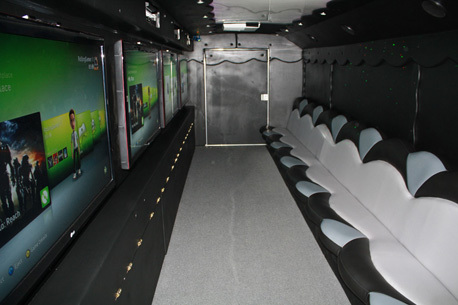 The Extreme Game Truck can hold up to 24 players. It features six 55" screens, six Wii consoles, four Xbox 360 consoles and 1 Playstation 3 console. No more fighting over the game controller, at this party everyone plays! Inside the truck you'll find a plush limousine interior, laser light show, climate control, surround sound and an iPod dock. The Extreme Game Truck is a guaranteed win!! Check out this great deal and many others at Plum District! For those of you not in Orange County, check out the national deals HERE! Wow. What a brilliant idea.